Hunter can easily integrate with your Salesforce account to automatically export new generated leads. To get started simply go to the "Leads"section of your account or from the "Applications section". Make sure you already have a list with all the leads you’ll need to import in Salesforce. Contact us, If you need help with creating leads in Hunter. 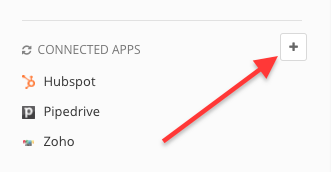 When you are ready to export your List, click the + icon in the Connected Apps section. Select Allow to allow Hunter access your Salesforce account. Now you’ll see Salesforce in the Connected Applications. Log in to your Salesforce account and go to the Leads section. Here you’ll see all the leads in the list previously created on Hunter. Please note: Hunter automatically maps the default Salesforce fields with the Hunter ones. If you have any custom Salesforce fields, unfortunately, you won’t be able to sync them with Hunter at the moment. In case you are using the Professional Edition you may have to contact Salesforce Support to enable the API. For the Enterprise Edition and the Unlimited Edition it is automatically enabled. Hunter will automatically synchronize both newly generated leads and leads already saved before launching the integration.